I am on the hunt for a cyclops model. A few months ago I noticed an out of production cyclops miniature on eBay. I watched it, but foolishly let it go. Now that I have started this Ultima project I really wish I had it! The seller did not know the manufacturer. The model was clothed only in a fur caveman-type outfit. Anybody know who made it? There is another cyclops on eBay now, but it's wearing a helmet—that's way too civilized for my tastes. The model also looks like it is suffering from lead rot. Steve Barber Miniatures has a great cyclops in it's Greek Mythology range, but it looks like it is really big, more of a giant than a troll-sized beast. Black Tree Design has a cyclops, but their's has satyr legs, scales, and a horn. The above illustration from Hartmann Schedel's Nuremberg Chronicle, 1493. 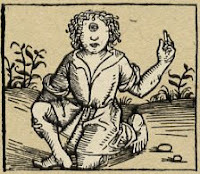 The cyclops is among the many fanciful people and creatures reported by returning explorers. The idea of the cyclops originated with the Greeks. The most famous cyclops is found in Homer's Odyssey. It has been theorized that the Greeks came up with the cyclops after finding fossils of elephant skulls. The trunk cavity looks like it could house a giant single eye (the real eye sockets are on the sides). The islands of Crete and Sicily are rich in fossil bones. See The First Fossil Hunters: Paleontology in Greek and Roman Times by Adrienne Mayor. I've since discovered Blood Moon Miniatures Thy have two very nice cyclops models. p3 on their store pages.